Updated: The big server makers cannot buy a break these days. The latest IDC research provides more evidence,showing that for the first quarter, worldwide server revenue was down nearly 8 percent. That’s even worse than Gartner’s data, released earlier this week, which showed worldwide server revenue down 5 percent. 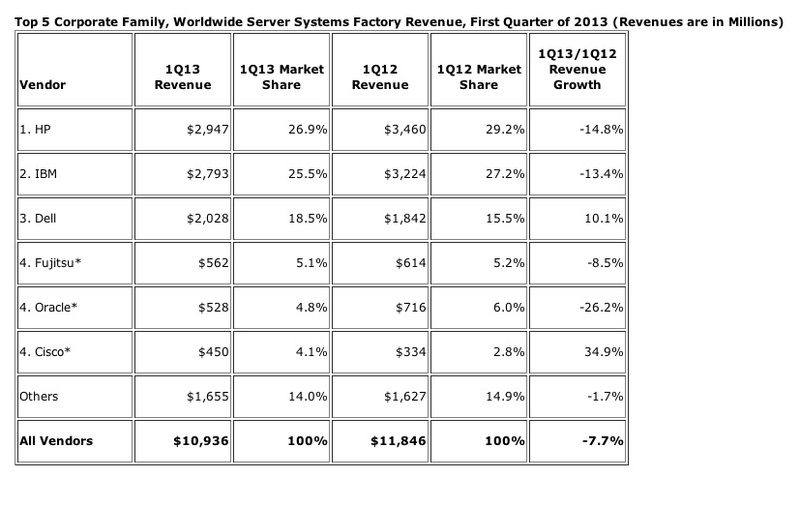 According to IDC, revenue for every name-brand server maker except Dell(s dell) and Cisco(s csco), was down. Market leader Hewlett-Packard(s hpq) saw its revenue for the period off 14.8 percent year over year. (On the last HP earnings call, CEO Meg Whitman acknowledged that the company is passing on low-margin server deals.) Looks like Dell, with revenue up 10.1 percent year over year, is picking up the slack. Cisco, which is building from a much smaller base, was up a whopping 34.9 percent, but it’s still got a small slice of the pie with Q1 revenue at $450 million, compared to $2.9 billion for HP, $2.8 billion for IBM and just over $2 billion for Dell. Cisco’s market share rose to 4.1 percent from 2.8 percent. Oracle’s hardware struggles continue — its revenue was off 26.2 percent year over year and its market share fell to 4.8 percent from 6 percent last year. Some of the companies with smaller share numbers, saw phenomenal growth in units shipped year over year. Lenovo, for example,shipped 48.8 percent more servers this year over last, but that pales in comparison to SGI (SGI??!!) unit growth which was up 98.7 percent. Chinese giant Huawei, however, saw the steepest growth curve, with units shipped up a whopping 156.6 percent. Huawei saw its overall market share raise from 0.6 percent to 1.6 percent. But most interesting is that unit shipments from “other” companies were actually off 2 percent year to year. Didn’t expect that. The much-watched non-brand-name “other” segment — which includes companies like Wistron and Quanta — saw aggregate revenue fall 1.7 percent but market share growing to 14.9 percent from 14 percent. Companies running huge data farms — the Googles(S goog) and Facebooks(S fb) — often turn to these companies for white box servers built to their specifications, a development that has to irk the name brands who seem to be seeing the addressable market for their servers shrinking. Here’s Jordan Novet’s take on the Gartner research. This story was updated at 6:18 a.m. PDT with additional information on unit shipments from IDC and again at 8:38 p.m. PDT to correct the Oracle server market share figures in the text. per the chart on the page (and the actual IDC ServerTracker) … Revenues were off 26.2% Y/Y and share fell to 4.8% from 6.0% last year. thanks bill. i read the wrong row of the chart. it’s fixed. Just wait a year or so until those Huawei boxes with their cheap capacitors and other junk components go belly-up to evaluate what a deal they are. Tom needs to check where all Huawei’s competitors make their products before he pours scorn on their very capable products….yes China, in the same city as Huawei ironically enough. Looks like the lower priced systems are growing at the expense of the higher priced ones. No surprise due to ‘cloud’. Has IDC given us data on ASP?